The Carpet One Floor & Home Difference As a cooperative with 1,000 stores worldwide, Carpet One Floor & Home not only has enormous buying power but also has partners in all of the major brands, mills and manufacturers. They’ve done the research for you. Just tell them your needs, and they’ll satisfy you beyond your expectations. LOCALLY OWNED STORES All Carpet One Floor & Home stores are independently owned local businesses. You can feel good supporting your community as you shop. 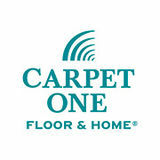 COMPETITIVE PRICES As part of the largest buyer of floor covering in North America, Carpet One Floor & Home is able to negotiate great prices and pass those savings on to its customers. EXCLUSIVE BRANDS With exclusive brands such as Lees®, Tigressá®, Bigelow®, Rustic River™ and Invincible™, Carpet One Floor & Home products set the industry standard for beauty, style and quality. LEADING FLOORING EXPERTS Carpet One Floor & Home professionals are experts in their field, with training, certifications and years of industry experience. Customers feel confident in the process, from selection through installation. COMMUNITY FOCUSED Carpet One Floor & Home is a community-focused business that believes in serving the employees, customers and communities in which it does business. The First Antimicrobial Flooring Installation Process. See the color you expect to, for as long as you expect to. You can tell when the color in the store doesn’t match the color on your wall. When we reinvented our paint, we created our exclusive Gennex® Color Technology which makes our paint simpler on the inside and truer on the outside. So you get exactly what you expect. That’s proudly particular. To find a local retailer, go to benjaminmoore.com ©2018 Benjamin Moore & Co. Benjamin Moore, Gennex, Paint like no other, and the triangle “M” symbol are registered trademarks licensed to Benjamin Moore & Co. The colors of spring never cease to inspire, and this season, we’re hot on hues of copper, raw wood, wildflowers and honeycomb. Incorporate these seasonal shades through throw pillows, accessories and floral arrangements. DISTRESSED TO IMPRESS C ra f te d w i t h PRIDE, o u r u n i q u e d i st resse d h a rd wo o d p l a n k s e m b o d y a o n e - o f - a - k i n d o l d - w o r l d fe e l i n g t h a t w i l l t ra n s p o r t yo u r h o m e b a c k to ye a r s w h e n Q UA L I T Y a n d C H A R AC T E R s to o d t h e te s t o f t i m e. Shop and learn more about Rustic Riverâ&#x201E;¢ Hardwood at CarpetOne.com. The rococo style is characterized by elaborate ornamentation, pastel colors, and embellished curved designs. These elements can be incorporated in many different ways. 1. An elaborate pattern makes an elegant statement on a bedroom wall. 2. Combining layers and patters makes this room feel elaborate but still comfortable. 3. Pillows with pastel colors and patterns are a great way to add a subtle touch of rococo. 4. Thereâ&#x20AC;&#x2122;s nothing like a beautiful chandelier to add elegance to any space. 5. A pastel blue island and striking veining combine to create easy elegance in a kitchen. GET IN THE MOOD In this rococo-style mood board, we incorporated soft, rich textures into a pastel-and-ivory color scheme to create a look that is both whimsical and dynamic. When paired with Falcon Crest Hickory in Rambler Brown by Rustic River Hardwood, we discover a contrast that brings these tones to life and further enhances their natural beauty. Much like the sophistication of the rococo era, we reinstated florals and plant motifs under the same color scheme to pull the whole look together. The pastel tones are soothing and timeless, lending themselves to a neutral architectural palette. The classic charm of this look embodies revived patterns, whereas the addition of antique porcelain tiles alongside rare, soft-hued marbles with subtle veining helps the style remain understated and humble. NATURAL, SUSTAINABLE, BEAUTIFUL FLOORS. INSPIRE YOUR STYLE. Shop and learn more about the VoyagerTM Collection at CarpetOne.com. Have you ever stepped into a dive bar with undeniable character, a diner in which you immediately felt at home, or a hotel that made you feel like you jumped several tax brackets even though you booked through Groupon? How much do these experiences stand out in your memory? Is it easy to recall the way they made you feel, or can you recognize the shift in your emotions as you experienced them? Design psychology is what makes these spaces evoke emotional responses in us. Design psychology is the underlying reason individuals and companies care about or invest in design at all. It’s not necessarily about the details but rather the feelings the details create. When a client says she wants the home to “feel” like her, she’s asking me to rely on the principles of design psychology to create a space that continuously evokes a particular emotion. When commercial clients say they want a productive and inspiring space, they’re asking me to create a winning combination for their team that promotes creativity and efficiency. Deep down, the result we’re looking for is an emotional connection. By putting design psychology at the forefront of my design process, I can better address the true desires of my clients and create a space that will go beyond their expectations. By putting design psychology at the forefront of my design process, I can better address the true desires of my clients and create a space that will go beyond their expectations. helps me make designer choices that will achieve the desired result. I have a strong example of this advice: one of my clients, whose sister was killed decades ago, still had the majority of her sister’s furniture in her living room. Naturally, she wanted a change because she felt a heaviness in her home. Her decorations were her sister’s belongings, which did not reflect her style, and they also served as a reminder of a family tragedy. Even though my client didn’t want to forget her sister, having these belongings in her home wasn’t evoking happy emotions or memories of her sister. Utilizing design psychology, we conducted a deep, emotion-based inventory of the items before picking mementos that had positive memories. We then reupholstered furnishings to match the client’s new style while still incorporating the mementos of her sister into a fresh, positive style that was the client’s own. This example is design psychology at work. I could have come in and suggested changing colors, carpet, and furniture, but that isn’t a profound, emotional way of looking at a space and its purpose for the client. Looking at this project from a design psychology perspective, we could achieve the result of creating a harmonious feeling and successfully reclaiming a memory. With both residential and commercial designs, there is likely to be an emotional catalyst or an impending change driving them. To truly “nail” the vision of my client, I focus not only on trends and style but also look at the ways I can create the emotional responses clients’ truly want for a design that will go beyond the superficial. How do you want to feel when you walk into the room? What kind of activity will occur in the space and what mind-set does that require? What purpose does the room serve for you and others? Always in style, always right on point, tile is as timeless as it is trendy, so it’s no surprise that tile is featured prominently on the “hot” list this spring. In keeping with the rustic and reclaimed looks that are so highly coveted at the moment, the latest tile trends invoke reflections of the natural world, with lush textures and visuals making today’s tile a tactile experience that ignites the senses. Realistic wood-looks reign supreme this season, as do textures and patterns inspired by fine fabrics and precious metals. While hardly a new concept, wood-look flooring remains at the top of the trend charts for spring 2019. The popularity of this motif is expected to increase in the years to come, making it a worthy investment. Wood-look flooring has been a leading flooring trend for the past several years and shows no signs of slowing down. This is great news for tile aficionados because tile is rife with woodlook options that capture both the look and feel of burnished hardwood while being extremely durable and easy to maintain. And for those who are on the fence about passing trends, wood-look tile offers you the best of both worlds: a classic appearance that’s showing no sign of waning in popularity anytime soon, along with tile’s sheer convenience and resilience. that combines the comfort of faded denim with the sophistication of Italian menswear and adds bling to your finished basement—but don’t rule it out for your hallways, either! Shine, shine on this spring, with stunning tile that shimmers. We love Alchemy in Silver by Emser Tile. Designed to stand on its own, yet highlighting all of your bold accent pieces, this precious metal-inspired porcelain adds undeniable depth to your walls, floors, or counters. Regardless of the look you opt for, there are many benefits to textured and patterned tile, benefits that will far outlive any fleeting trend. Simply put, your new tile boasts the uncanny ability to mask everyday dirt and dust, thus simplifying your everyday routine (we can’t think of anyone who wouldn’t appreciate this lovely little bonus!). A COMPLETE LINE OF FLOOR CARE PRODUCTS UNIQUELY FORMULATED TO HELP YOU EASILY CLEAN AND MAINTAIN YOUR FLOORS. A stylish, functional living space is an important feature in any home. In an exclusive Beautiful Design Made Simple video, interior designer Kate Davidson offers tips for creating a beautiful living space that is perfect for large families and entertaining. From using a neutral color palette with pops of color to allowing for plenty of seating, Kate shares expert insight on designing a living space to love. Watch as Kate walks us through this inviting, bright living space offering insight into what makes this space perfect for the family it serves. Tap to watch Kateâ&#x20AC;&#x2122;s video. When it comes to the kitchen, a small layout can feel participarly limiting. As the heart of a home, this space is often a popular spot for friends and family to gather. In an exclusive Beautiful Design Made Simple video, interior designer Linda Mazur offers insight into overcoming a petite footprint by creating a design that feels open yet defined while containing all your desired elements. Watch as Linda walks us through this beautiful midcentury modern interior, covering the important elements of a small kitchen design from layout and lighting to cabinetry and color palettes. Having kids in your home definitely affects your home décor decisions, but this impact doesn’t have to be negative. Keeping children in mind means considering how they’ll use the space differently than the adults in your home will. It is possible to combine the aesthetic appeal we crave along with the fun and entertaining elements that kids need. These ten design ideas demonstrate that a combination of kid-friendly design and beautiful aesthetics is easier to find than you think. Fun with Color When was the last time you heard anyone under the age of twelve say she was really hoping for a gray bedroom? Probably never. Kids love colors, so why not create some visual stimulation in your space with your children’s (or your) favorite colors. Adding color doesn’t mean you have to go crazy, or that you can’t return to a more muted palette as your children grow. Choose neutrals for larger purchases, like flooring and staple furniture, and save the colors for smaller, more temporary elements. Frame windows with color. A simple, yet unexpected, way to add brightness is to use a vibrant color around windows. We love the pop of red in this family-friendly space. Adding color can be as simple as stacking colorful books and boxes on a desk. Once you start looking for opportunities to add color, the possibilities are endless. Pillows and poufs are easy ways to add color, and they can be swapped frequently to change your space. Kid-Friendly Storage The key to effective toy storage is making clean-up time easy. When you’re planning a space with kids in mind, it’s important not to ignore all their stuff—and they have a lot of stuff, don’t they? Baskets are an easy way to conceal clutter, and these oversized hiding places make it easy for kids to stash their belongings. Collect similar items together, and store them out in the open. A jar of crayons or a stack of board games make great accessories and even add some color. Create a pretty “dump zone” near your primary entrance. Leaving space to drop bags, sports gear, and other items right when you walk in the door keeps clutter contained. Art You Can All Love Art in our homes serves many purposes. It can cheer us up, inspire us, and remind us of places and people we love. Your kids should enjoy the art in your home too. There are many ways to give your children something theyâ&#x20AC;&#x2122;ll enjoy while still maintaining your sense of style. 7. Keep art projects contained. Designate a space to display your childrenâ&#x20AC;&#x2122;s art, such as a specific spot on the wall, or a backdrop to a bookcase. Animal art is great for children and adults. Find colorful drawings of your child’s favorite animal or even small sculptures to add personality to any space. Durable and Soft Places to Play While it may not seem like flooring is important to your children, it’s one of the most important decisions in kidfriendly design. 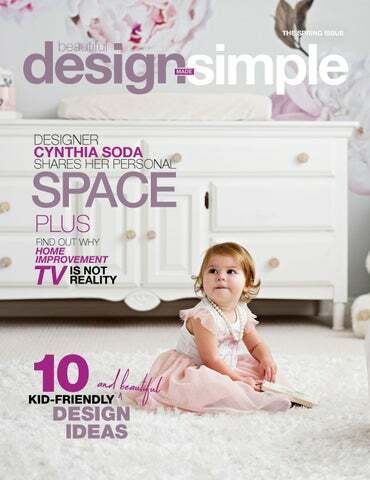 Soft, stain-resistant carpet is perfect for playrooms and kids’ bedrooms. It absorbs sound and gives your children a comfortable, safe place to play. For areas of your home where you still want a beautiful hard surface floor, look for durability. The finish on a hardwood floor or the water resistance of a vinyl floor are all things to consider with little ones in your home. For the beautiful look of hardwood and a floor that will stand up to play time, Luxury Vinyl floors come in both plank and tile styles. You may also hear them called LVT or LVP. These floors offer realistic visuals of hardwood and tile with added resistance to scratches and liquids. The toughest carpet with outstanding stain resistance and timeless style. LEES® featuring Ultra25® is the perfect blend of science and style combining groundbreaking stain protection and ultra-durable construction with a broad array of styles to express your taste. LEES® is the only carpet for the world you live in. often watch home renovations on TV and then come into design showrooms with unrealistic expectations. More often than not, homeowners have a warped perception of how long it will take to complete their home renovation and how far their budget will actually take them. Follow along as we give you suggestions on where to save money when you select products, what your budget should be, and what your renovation timeline will actually look like. So first things first—how do you start the design process? Come right in, team up with a designer, and select what products you want? Not quite. The first thing you need to do is measure the space in your home that you want to remodel or update. You can either measure the space yourself or invite a designer to come into your home to measure the room for you. Your designer will have more of an idea of what size space he or she will be working with, which will help with your project’s budgeting and planning process. This leads to our next step: determining your budget. So what do you do if you want to have the kitchen of your dreams but are handcuffed by a smaller budget? Most of the renovation shows have kitchen remodeling budgets of around $8,000–$12,000. Rarely will they go above the $20,000 mark on shows such as Fixer Upper and Property Brothers. However, most kitchen remodels will cost you closer to $30,000–$40,000. It’s recommended that customers spend about 10–15 percent of their estimated home value on cabinetry alone. To give you some perspective, if your home is worth $250K, you should be spending $25,000–$38,000 on just your cabinets. That’s a good deal more expensive than what the TV typically shows, and that’s just for cabinetry. So what do you do if you want to have the kitchen of your dreams but are handcuffed by a smaller budget? Well, product selection is the place to make choices that can save you money. because the installation will require more time and expertise. Another factor you don’t always think about is that it also takes a lot more grout to install these products. Neither of these factors can really be worked around, so what are some other product options? You can consider larger tiles, such as 4x4 size tiles, because you still achieve the tile look, possibly with some cool patterns, and the installation cost isn’t as high. An even more inexpensive option is luxury sheet vinyl. Sheet vinyl can be applied to walls as well as floors, and manufacturers have been developing some designs that mimic some of the popular tile patterns. Not to mention that it’s waterproof and not labor intensive to install. Selecting a vinyl option or larger tiles, among other alternatives, would be an avenue to keep some money in your budget. What does everyone also want right now, thanks to home improvement TV? Real hardwood floors! How many shows seek to uncover hidden hardwood floors or choose hardwood as their flooring option? A lot of them. Hardwoods aren’t always what they’re cut out to be. They are much more expensive than other flooring options— arguably the most expensive flooring choice. Hardwoods don’t like moisture and water, so they’re not best suited for kitchens. They’re also extremely at risk for scratches and dents, not to mention their complete vulnerability to high-heeled shoes. Hardwoods aren’t the best choice if you have children and pets that can damage your floors. Is there an option out there that is less expensive and not quite so sensitive? There is! Relatively new on the scene and quickly gaining popularity are luxury vinyl planks, otherwise known as LVP. LVP is water and scratch resistant and low maintenance. It can range from two to four dollars cheaper per square foot than hardwood. Advances in technology have also allowed these floors to look and feel extremely similar to hardwood, so the only one who will know they’re not real hardwoods is you. they are installed, someone will need to go out to the house and make a template for your countertops on-site. Once the template has been made, it takes about seven to ten days for the countertop to come in and one day to install. Another thing to consider: if you decide on a large island like the ones we often see on the shows, you may have to hire two crews to install your countertops because of the weight of the material. You can thus expect to wait at least six weeks for your products to come in, as well as an additional few days for your products to be installed. You may feel like you’ve been waiting an eternity to finally show off your new kitchen that you’ve been working on for months, but it will be well worth the time and effort! Hardwood isn’t the best choice if you have children and pets that can damage your floors. In the end, it’s safe to say that we enjoy watching shows that let us see the potential of our own homes by witnessing amazing transformations on TV. We all want a home we’re proud of and enjoy living in. When you’re taking on your next project, keep in mind that the design process takes some time and requires information about the space you’re renovating before you can get started. A great place to find some savings is when you’re selecting products—as long as you’re open to options that you may not have seen on TV. The lead time during the ordering process will make you wish you had a time machine so you could skip the wait, but it will be well worth it in the end. The company you work with will want you to be happy with your completed home project, so be patient with it and have realistic expectations of how long your remodel will last and how far your budget will take you. Not all dream homes can be transformed in under sixty minutes, but they can still become a reality. Rosemary and Lindsay put together a mood board that can be used as design inspiration for a master bathroom. The design centered around the sleek, navy cabinet door. After this selection, they chose tile with a pop of blue, like the cement-look tile by Interceramic and the textured subway tile by Emser. Rosemary and Lindsay pulled in some light tones with the white, 3D tile by Speartek, which can be used as a wall tile in showers, and Interceramic’s Calacatta Mosaic Weave. They selected hardware by Jeffrey Alexander and pulled in more gold tones by pairing it with Elegant Mosaic’s Crystal Glass tile. This look offers interchangeable tile options that are fun with a hint of a nautical theme. This design can be customized to best fit your style! I was in middle school when my grandma was diagnosed with breast cancer. She underwent surgery, chemotherapy and radiation — all while raising me. Thankfully, researchers supported by the Breast Cancer Research Foundation have invested years into studying the disease to provide effective treatment options for women like my grandma. My grandma entered remission and was there to support me when, years later, I was diagnosed with cancer. Scientific advancements helped me get past my disease too. Today we’re fortunate enough to call ourselves cancer survivors. That’s why I have chosen to dedicate my career to helping more women like us. This gave her a new lease on life. Research is the reason we have each other. NOW WHAT? April showers bring May flowers—and muddy messes. From just a few sets of shoes to lots of little feet and a few pairs of paws, mud and carpet go hand-in-hand come spring. But don’t stress. Your carpets will prevail if you arm yourself with the Stain First Aid app. Create your cleaning solution: Mix ½ teaspoon clear dishwashing detergent with one cup of warm (not hot) water. Scrape or blot up excess spill. Blotting Tip: Absorb the excess liquid from the carpet by pressing straight down with a clean, dry, white paper towel. Do not rub. Apply detergent solution using a damp towel. Apply undiluted white vinegar using a damp towel. Apply water with a damp sponge. Blot again. Finish by weighing down a half-inch thick pad of white paper towels to absorb all the moisture. Leave overnight if necessary. Note: Not all carpet fibers react the same way when treated for stains. Before proceeding with any of the preceding cleaning procedures, we recommend you contact the appropriate fiber company for their suggested maintenance guidelines. Failure to follow these carpet stain removal guidelines may void your warranty. For more information, please contact your Carpet One Floor & Home retailer. SPILLS AND STAINS ARE A PART OF LIFE... But they don’t have to stay with you forever. Be prepared to tackle any stain that life throws at you with Carpet One Floor & Home’s Stain First Aid app. It’s free for your iPhone, iPad, Android phone or Android tablet. Learn the basics of cleaning up a stain with easy-to-follow video instructions. Have the right tools on hand with recommended cleaning supplies. Never panic again when spills happen. Stain First Aid has over 50 of the most common household stains covered, including detailed cleaning instructions and video tips. The first step in selling your home is to stop thinking of it as “your home.” Once you’ve decided to put it on the market, you have to emotionally detach yourself and start looking at this process from the homebuyer’s perspective. Home staging is not just decorating your home; it’s decorating and marketing the home and all its best features to attract the right buyer with the right budget. You’re selling a very expensive product, so having the proper packaging is critical. The following factors should be taken into consideration when staging your home for sale. THE LISTING PRICE How much are you asking for your home? Select furniture that matches that level of investment. High-end homes should be outfitted with luxurious, trendy furnishings and accessories to attract the right type of buyer. Translation: now is the time to get rid of old hand-me-downs and elevate your home’s appeal with pieces that are appropriately sized, styled, and suited to high-brow homebuyers. Believe it or not, dated, damaged, or cheap-looking furniture can negatively affect the perceived value of your home, which can thus negatively affect the price buyers are willing to pay for your home. EXPERT STYLING TIP Stay neutral when it comes to furniture and other big-ticket items. Itâ&#x20AC;&#x2122;s easy and cost-efficient to incorporate color and texture through pillows, rugs, and other decorative pieces to increase visual interest. Homebuyers enjoy different lifestyles depending on where they are looking to purchase a home. Keep this in mind when staging spare rooms or unused areas in your home. If you’re located in the suburbs, a nursery may be more appealing to a broader pool of suburban buyers. In contrast, a home office could be a real selling feature to condo buyers in a downtown location. Know whom you’re trying to attract and then give them the right incentive to make you an offer. Function plays a significant role in the home-staging process. How do you travel through your home? What are the high-traffic areas? Be careful not to block walkways, and avoid placing furniture near doorways, which can make a room feel cramped. Leave sightlines to windows and other focal points, such as a beautiful fireplace, open. Reduce your furniture to the essentials to free up space and create the illusion of a larger room. To sell your home for top dollar, you’ve got to think like a buyer. What are buyers looking for? How much are they willing to spend? What are the biggest selling features? When it comes to selling your home in a competitive real estate market, don’t leave anything to chance. A little professional staging can go a long way. STYLE OF HOME The “wow” factor that homebuyers look for is often achieved when the style of the home, furniture, color, and other decorative elements are all harmonious. Pick a design direction that best suits the physical structure of your home. If the home is modern and elegant, opt for contemporary-style furniture that reflects a sleek, minimal aesthetic. Balance and harmony are essential. Speaking of keeping it personal, this print incorporates a purple Pantone color inspired by the purple hue of Soda’s hair. we allow ourselves to indulge a little in our own talents. For my family, it was a combination of all of these things, a trifecta of opportunities leading to the blood, sweat, and tears we’ve invested back into our family home. Once the ball gets rolling, it can be hard to stop—so much so that our children get off the school bus each day and ask what Mommy’s doing to the house now. The kids rule the roost! Customdesigned millwork creates storage that supports their activities and fosters independence from an early age. Displaying your hobbies in the home adds personality in an unexpected way. Practicing what we preach, key areas get tackled first—priority spaces like the kitchen are at the front and center of our reno list. All the while, we are thinking ahead and planning how other key features can support our day-to-day needs in other areas of the home. We designed personalized built-ins for the entrance, we incorporated enough storage to hold all the clutter that gets thrown into bathrooms, and we even planned our children’s rooms to foster their independence with simple storage solutions for them to easily access their own things. It’s important to be organized and have a place for everything, and for our home to support our daily activities. These tasks can be accomplished even while maintaining personal style. We also had the chance to try out several exciting ideas we had not been able to use yet because they were vetoed by our clients! Color-blocking ebony wood tones creates a dynamic effect. A custom light fixture takes center stage over the island. Layering textures with wood tones create depth and adds warmth. Bathrooms with modern amenities and adequate storage ensure you start and end your day in comfortable luxury. Peony decals transform this Iced Cubed Silver bedroom from a boy’s nursery into a girly space. From statement walls and stand out pieces to subtle nods and simple prints, floral-inspired dĂŠcor has taken flight this spring. Natureâ&#x20AC;&#x2122;s fibers continue to capture hearts. Raw wood, woven rattan, pampas grass and pebbled tile are a few of our favorites. Hard lines are giving way to soft curves. From furniture and flooring to wood work and wall art, a curvier aesthetic is the latest craze. Spring is a time for new beginnings and a renewed sense of space, filled with all the textures, colors, and patterns that symbolize a fresh, clean slate. We hope this collection of bright, vibrant new looks will inspire you to refresh your own surroundings, making your home a continued source of growth and regeneration. Multicolored metallic tile accents a small sideboard, while Art-Deco-inspired furnishings take center stage in this bright and welcoming dining space by Sara Bederman. A melding of different tile styles makes for a neutral bath that manages to stay bold in Sara Bedermanâ&#x20AC;&#x2122;s splendid, splash-proof composition. THE INSPIRATION NEVER STOPS Now, you donâ&#x20AC;&#x2122;t have to wait for our next issue to get inspiration, ideas and tips on creating and maintaining your beautiful home. Find out more tips at carpetone.com/beautiful-design-made-simple. There are so many amazing opportunities to work with spaces in a home. Some homes offer open spaces where strategic furniture layouts help to make the space feel intimate, whereas other homes have a more traditional layout, with smaller rooms that need creative planning to get the most out of the space. Regardless of the space, it is important to be thoughtful about which furniture is selected and what design details can contribute to the overall impact and use of the room. I have had the pleasure of designing both large and smaller spaces. My goal is always the same: create a space that is intimate, warm, and invitingâ&#x20AC;&#x201D;somewhere my clients can be excited to welcome their guests but also kick back and relax on their own. I enjoy identifying nooks in homes where value can be added to make the space shine. In a small mid-town home, I recently turned a tight front entrance into a glowing, functional first impression. When I first met the clients, the front foyer felt dead and utilitarian. Its dĂŠcor desperately needed a sense of movement while also improving the function of the space. As the only practical entrance to the home, it was vital that we accounted for daily coat and shoe storage. We also had to make sure to have a beautiful surface where mail and keys could be conveniently placed. Classic floral wallpaper was chosen to breathe life into the space. It immediately gave the foyer a lift and a sense of cheer. A custom walnut shelf was hung with stunning satin brass brackets. We added bright lighting, and for additional practicality, a row of mosaic tiles at the edge of the hardwood floor, where wet boots and shoes could be left to dry. Now the front entry greets homeowners with cheerful dĂŠcor designed to accommodate the daily demands of the space. For another example, always moving forward with practicality at the forefront of our designs, we turned an awkward corner of a family room into a miniature children’s study. Designed to offer a convenient landing place for children after school, this corner of the room has twin desks, one on each side of the space. It is near the kitchen in case homework help is needed, yet far enough away to offer privacy and a bit of quiet. The space was designed in beautiful neutrals so as not to take away from the sophisticated interior of the adjacent kitchen and family room. Outfitted with all the necessities of a home office—a great work surface, file drawers, and lots of storage—these desks can be used by kids and parents alike. In a New York City apartment, we tackled a dark corner of the kitchen to reinvigorate it with new life. When space is at an ultimate premium, having an eat-in breakfast table is a true luxury. We utilized bench seating to make every inch count and add space so that friends and guests could be invited over to share a meal. A chic custom kitchen table with a hardworking Corian top shows at the center of the space. A hammered metal base adds a reflective touch, which shows nicely in the otherwise-dim corner, and classic bleached white side chairs finish off the seating. Topped with a stunning hand-blown bubble chandelier, this eating nook is the perfect place to spend a New York minute. In contrast, a large home we designed in Toronto had a bright and airy breakfast room that needed to be dressed. Although size was not an issue, space was still a consideration. With the refrigerator located close by, we had to ensure the furniture sizing was in proportion to the space available. Nothing could be compromised: the fridge and freezer had to have easy access, and we also needed to guarantee a table large enough to seat six people. Not an easy task! We chose a lovely oak dining table with beautiful whitewashed side chairs. The chairs, upholstered with a family-friendly fabric, were the perfect blend of comfort, style, and function. Regardless of where you hang your hat, your home offers endless possibilities and is the perfect place for you to express yourself. Although it’s sometimes challenging to achieve that perfect balance, there’s always a smart style solution waiting in the wings, proving to us that whether your living space is small or expansive, there’s truly no place like home! Soft and lush – and ultra tough. WATERPROOF. FEATURING A 10-YEAR NO-EXCLUSIONS STAIN WARRANTY. Shop and learn more about Oath by Resista® at CarpetOne.com. What was the inspiration for this space? I sought inspiration from my travels—I visit France frequently, and I spent the summer there immediately before designing this room—and my love of couture. I was heavily influenced by both the Christian Dior exhibit at the Musée des Arts Décoratifs in Paris and the Balenciaga exhibit at the Victoria and Albert Museum in London. My goal was to employ traditional silhouettes and patterns in a modern, fashion-forward way using the highest level of artistry and craftsmanship, resulting in a classically French couture interpretation of nature. Which element was used as a starting point for the design? While gathering my inspiration, I fell in love with a pair of birdcage earrings from Of Rare Origin. When I found the Gucci Tropical Paradise artwork and Canopy Designs chandelier, I knew the design was meant to be. The bed makes such a statement. What is your best advice for working with florals? I adore florals, especially multicolored florals. When working with floral patterns, I prefer to use that fabric as my starting point. Once you find a floral that incorporates the colors you hope to use throughout the space, the rest of the fabrics will fall into place. For those who are hesitant about floral patterns, drapery is actually a wonderful place to begin. When the drapery panels are pleated down, the eye tends to sense color and movement rather than an obvious pattern. Tell us about the area rug. The texture and dimension is just lovely. I love large area rugs; they make the room look so much more expansive in comparison to smaller rugs. Here, the rug needed to be impactful enough to hold its own with the other design elements but quiet enough to work with the overall scheme. The floral headboard and the mid-century drapery fabric command attention! That’s why I chose a flat weave rug with a small-scale pattern. It “reads” as a solid but with much more visual interest. We just love the use of black throughout this space. What’s the secret to using this moody hue? The secret to using black is contrast. It’s important to have elements that play off one another. The juxtaposition is what makes a room interesting. Here, the pops of black are balanced by the abundant use of white, plus the other textures in the room. Finish the sentence: every bedroom needs… Every bedroom needs luxurious and layered bedding. Think about how important a good night of sleep is to our overall well-being—not to mention the amount of time we spend in bed over our lifetimes. Especially in guest bedrooms, I like to combine a coverlet or a quilt with a duvet or other blanket so that there are options for people who sleep either hot or cold. What was your favorite part of this project and why? My favorite part of this project was working with the artisans and craftspeople represented in the room. The lamps were handmade in Houston, Texas, by Liz Marsh of Liz Marsh Designs. The Gucci Tropical Paradise artwork by Charlotte-based Stephen Wilson is breathtaking. The plaster mirrors over the bed were sculpted by a French artist; I purchased them at the Paris flea market. There is so much art displayed in this room, not just what is seen hanging on the walls. • SOLIDCORE CONSTRUCTION •INVINCIBLE INTENSITY SURFACESHIELD™ •3D PROTECTIVE BACKING See store for details. FLOORING 101 CARPET ONE FLOOR & HOME HAS THE WIDEST SELECTION OF COLORS AND STYLES AVAILABLE TO FIT YOUR SPECIFIC FLOORING NEEDS. BUT BEFORE YOU CHOOSE, HERE ARE SOME BASIC GUIDELINES FOR DETERMINING WHICH FLOORING OPTION IS RIGHT FOR YOU. Carpet is a great choice for almost any room within your home because of its warmth, comforting and quiet qualities. With todayâ&#x20AC;&#x2122;s advanced flooring technologies, carpet is softer, stronger and more stain resistant than ever before. Carpet comes in a variety of colors, patterns and styles and is a key design element for your room remodel. Hardwood flooring has beauty, strength and character, along with options for every look. From smooth, glossy, traditional strips to wide, weathered planks, hardwood creates a beautiful backdrop for any room. Todayâ&#x20AC;&#x2122;s hardwood floors are also milled and finished using techniques that require much lower maintenance than in years past. Vinyl flooring offers an elegant appearance and an enduring value. Modern, cutting-edge technologies and digital design make natural-looking textures and great visual depth possible. Luxury vinyl tile is one of the newest, most popular flooring choices today, offering trendy finishes that closely resemble wood, tile and stone. TILE Both timeless and trendy, tile can complement any style, ranging from traditional to contemporary. Tile is available in a wide variety of colors, patterns and sizes, allowing for creativity in design. The flooring also resists most spills and is a great option for moisture-prone areas such as kitchens, bathrooms and foyers. Laminate flooring offers the look of hardwood, tile or stone at a more affordable price point. The unique construction of laminate flooring makes the product highly durable and water resistant, and therefore a great candidate for high-traffic and moisture-prone areas. AREA RUGS Area rugs make a wonderful addition to hard surface flooring, adding a level of protection, along with increased warmth and comfort. Available in a wide variety of colors, designs and sizes, area rugs can play a major role in a roomâ&#x20AC;&#x2122;s dĂŠcor. Loop carpet consists of yarns that are looped and uncut •	Offers strength and inherent soil-hiding capabilities on the carpet surface. The pile height can vary from low •	Shadings resist traffic patterns while making colors appear rich and tightly constructed to a more luxurious high-level •	Ideal for heavy traffic areas pile. A combination of high-cut tufts and lower loops creates a variety of sculpted patterns. Frieze carpet, often called “Twist,” is a cut-pile style carpet consisting of highly twisted yarns. PLUSH Plush carpet is constructed with a dense, deep pile and is sometimes called “velvet” because of its velvety or velour-like appearance. Polyester is a popular carpet fiber option. It is inherently stain-resistant and produces some of the most beautiful color variations available. It is also extremely fade-resistant and therefore a popular option for areas exposed to long periods of sunlight. It is typically a more affordable fiber option, but it is not as durable or resilient as nylon. Nylon is one of the most popular carpet fibers and has long been known for its high performance and durability. It offers diversity, style, and color and is typically less likely to mat than other fibers. While durable, nylon is not inherently stainresistant. Therefore, nylon is treated with a stain-resistant solution during the manufacturing process. Nylon is typically a more expensive fiber and has a reputation for being the all-around best performer. Triexta is the newest fiber in the carpet industry. Made from the same general chemical composition as polyester, triexta was originally defined as a subset of that material. Triexta is now recognized as more durable and resilient than conventional polyester while maintaining the same inherently superior stain-resistant properties. All natural and non synthetic, wool fiber carpet is a truly green product. Wool remains the premier fiber in carpet construction and a traditional favorite, offering a deep, rich look and feel. It has excellent resilience and durability, although it can wear down after many years of use. Wool is naturally stainresistant and cleans especially well. However, because wool can hold up to ten times its weight in moisture, special care is needed when cleaning carpets made with it. Wool is the most expensive fiber type, but if having an all-natural carpet is important, wool is the fiber for you. Kelli Ellis is an award-winning interior designer and certified design psychology coach. You’ve likely seen her as a featured designer on TLC’s Clean Sweep, HGTV’s Takeover my Makeover or her design work on Bravo’s Real Housewives of Orange County or in Traditional Home and LUXE magazine. Cynthia Soda is the owner and principal designer of Soda Pop Design, Inc. Cynthia believes in and uses her design filter to successfully merge her clients’ lifestyles, personalities and architecture to create customized, liveable luxury that tells each client’s unique story. Sara Bederman is the principal designer of Sara Bederman Design. For over a decade, Sara’s bespoke design firm has become known for creating stylish, thoughtfully curated and livable interiors. Crisp lines, classic sensibilities, and chic palettes are the cornerstones of Traci Zeller’s aesthetic. Founder and principal of Traci Zeller Interiors, Traci’s award-winning work has been featured in national design publications like Better Homes and Gardens and Traditional Home. Kate Davidson, principal of Kate + Co Design, is known and respected for creating stylish, adaptable and liveable spaces. For over a decade, her multidisciplinary design firm has built a diverse portfolio of projects from private homes to gourmet bakeries and large-scale corporate offices. Principal of Dvira Interiors, Dvira is known for a vast number of successful endeavors, including her role as the designer and art director for the TV show Income Property. The award-winning designer is praised for creating approachable designs that are both beautiful and practical. An award-winning interior stylist and principal of Redesign4More, Red Barrinuevo is best known for enhancing and creating stylish yet functional spaces through his creative home staging and interior styling services. Linda Mazur is a nationally publicized designer backed by over fifteen years of experience in both residential and commercial design. Principal of Linda Mazur Design Group, her multidisciplinary design firm is known for creating innovative, stylish interiors and full-scale builds. Kitchen & Bath Designer Dalton Carpet One Floor & Home Lindsay is an in-house designer at Dalton Carpet One in Athens, Georgia. She enjoys designing spaces for her clients that they will love for years to come. Lindsay has fifteen years of experience as an interior designer and specializes in kitchen and bath design. Marketing Manager Dalton Carpet One Floor & Home Kristin is the Marketing Manager for Dalton Carpet One’s three retail locations in Georgia. She focuses on using innovative and imaginative ways to create unique experiences for customers through social media and email-marketing campaigns. Kristin also designs advertisements to market to customers through traditional and digital media. Rosemary is an in-house Kitchen & Bath Designer at Dalton Carpet One’s Athens location in Georgia. She has been a designer in the kitchen and bath industry for six years and enjoys using unique products in her clients’ designs for a look that leaves an impression. Rosemary specializes in cabinetry and likes to blend a contemporary aesthetic into her designs. THERE’S A LOCALLY OWNED CARPET ONE FLOOR & HOME NEAR YOU. LOCALLY OWNED. OVER 1000 STORES STRONG. Our cooperative unites independent businesses to gain buying power and scale. Together, we are North America’s largest floor covering buying group. We provide competitive pricing and value to you. As an independent family business supported by our membership in a cooperative, we are dedicated to giving back to our local community and helping others. Our cooperative is owned by us and other independent family businesses like us. We are focused on giving you – our customers – the positive shopping experience you deserve. † View warranty guide for details by visiting carpetone.com/the-beautiful-guarantee. © 2019 CCA GLOBAL PARTNERS, INC.
A quarterly interior design magazine created to inspire the ever-evolving design of your home.